Launched in May 2017, the Carbon Pricing Dashboard is an interactive online platform that provides up-to-date information on existing and emerging carbon pricing initiatives around the world. It builds on the data and analyses of the annual State and Trends of Carbon Pricing report series. The article was written and first published by World Bank. The interactive map allows to the user to investigate the development of regional, national and subnational carbon pricing initiatives over the past 30 years. It further provides details on prices and value of the specific initiatives worldwide. What is Carbon Pricing ? Carbon pricing is an instrument that captures the external costs of greenhouse gas (GHG) emissions—the costs of emissions that the public pays for, such as damage to crops, health care costs from heat waves and droughts, and loss of property from flooding and sea level rise—and ties them to their sources through a price, usually in the form of a price on the carbon dioxide (CO2) emitted. A price on carbon helps shift the burden for the damage from GHG emissions back to those who are responsible for it and who can avoid it. Instead of dictating who should reduce emissions where and how, a carbon price provides an economic signal to emitters, and allows them to decide to either transform their activities and lower their emissions, or continue emitting and paying for their emissions. In this way, the overall environmental goal is achieved in the most flexible and least-cost way to society. Placing an adequate price on GHG emissions is of fundamental relevance to internalise the external cost of climate change in the broadest possible range of economic decision making and in setting economic incentives for clean development. It can help to mobilise the financial investments required to stimulate clean technology and market innovation, fueling new, low-carbon drivers of economic growth. Carbon pricing can take different forms and shapes. In the State and Trends of Carbon Pricing series and on this website, carbon pricing refers to initiatives that put an explicit price on GHG emissions, i.e. a price expressed as a value per ton of carbon dioxide equivalent (tCO2e). Considering different carbon pricing approaches, an emissions trading system (ETS), on the one hand, provides certainty about the environmental impact, but the price remains flexible. A carbon tax, on the one hand, guarantees the carbon price in the economic system against an uncertain environmental outcome. Other main types of carbon pricing offset mechanisms, results-based climate finance (RBCF) and internal carbon prices set by organisations. Scaling up GHG emission reductions and lowering the cost of mitigation is crucial to decarbonise economies. Given the size and urgency imposed by the climate challenge, a full range of carbon pricing approaches will be required, alongside other supporting policies and regulations. And what are the main types of pricing initiatives? Cap-and-trade systems, which apply a cap or absolute limit on the emissions within the ETS and emissions allowances are distributed, usually for free or through auctions, for the amount of emissions equivalent to the cap. Baseline-and-credit systems, where baseline emissions levels are defined for individual regulated entities and credits are issued to entities that have reduced their emissions below this level. These credits can be sold to other entities exceeding their baseline emission levels. A carbon tax directly sets a price on carbon by defining an explicit tax rate on GHG emissions or—more commonly—on the carbon content of fossil fuels, i.e. a price per tCO2e. It is different from an ETS in that the emission reduction outcome of a carbon tax is not pre-defined but the carbon price is. An offset mechanism designates the GHG emission reductions from project- or program-based activities, which can be sold either domestically or in other countries. Offset programs issue carbon credits according to an accounting protocol and have their own registry. These credits can be used to meet compliance under an international agreement, domestic policies or corporate citizenship objectives related to GHG mitigation. RBCF is a funding approach where payments are made after pre-defined outputs or outcomes related to managing climate change, such as emission reductions, are delivered and verified. Many RBCF programs aim to purchase verified reductions in GHG emissions while at the same time reduce poverty, improve access to clean energy and offer health and community benefits. Internal carbon pricing is a tool an organisation uses internally to guide its decision-making process in relation to climate change impacts, risks and opportunities. For governments, the choice of carbon pricing type is based on national circumstances and political realities. In the context of mandatory carbon pricing initiatives, ETSs and carbon taxes are the most common types. 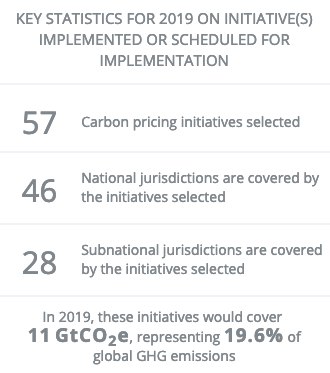 As of 2017, 42 countries and 25 subnational jurisdictions (cities, states and regions), already have carbon pricing initiatives, with more planning to implement carbon pricing in the future. The most suitable initiative type depends on the specific circumstances and context of a given jurisdiction, and the instrument’s policy objectives should be aligned with the broader national economic priorities and institutional capacities. ETSs and carbon taxes are increasingly being used in complementary ways, with features of both types often combined to form hybrid approaches to carbon pricing. Some initiatives also allow the use of credits from offset mechanisms as flexibility for compliance. Many companies use the carbon price they face in mandatory initiatives as a basis for their internal carbon price. Some companies adopt a range of carbon prices internally to take into account different prices across jurisdictions and/or to factor in future increases in mandatory carbon prices. GHG emissions can also be implicitly priced through other policy instruments such as the removal of fossil fuel subsidies, energy taxation, support for renewable energy, and energy efficiency certificate trading. Implicit carbon pricing initiatives are not covered in the State and Trends of Carbon Pricing series. There is a growing consensus among both governments and businesses on the fundamental role of carbon pricing in the transition to a decarbonised economy. For governments, carbon pricing is one of the instruments of the climate policy package needed to reduce emissions. In most cases, it is also be a source of revenue, which is particularly important in an economic environment of budgetary constraints. Businesses use internal carbon pricing to evaluate the impact of mandatory carbon prices on their operations and as a tool to identify potential climate risks and revenue opportunities. Finally, long-term investors use carbon pricing to analyse the potential impact of climate change policies on their investment portfolios, allowing them to reassess investment strategies and reallocate capital toward low-carbon or climate-resilient activities. To access the interactive map and more information on Carbon Pricing on an internal, regional, national, subnational and international level, please click here.